The Dutch heavy metal scene of the '80s has given birth to many jewels, and one of them was "Down Town", a debut LP of EMERALD. It was the only album of the band until now, when their long awaited comeback finally sees the light of day. A 32-year gap between the albums is huge... Many bands fail to revive their spirit, but EMERALD fans have nothing to fear: the record sounds as if it was a "lost" gem from the '80s! The songwriting hasn't changed (actually many of these songs were written soon after the debut was out), and Bert Kivits' vocals still have this incredible youthful energy and feel, though now they're smoother, not as extremely high-pitched and shrill as back in the day. The production is also totally old school - the fully analogue recording, engineering and mastering resulted in great warm sound, which will be for sure appreciated by the fans. And if you're not one of them yet, but love old heavy metal with a great dose of melody and clear NWOBHM influences, you will likely become one and put their new album next to classic records of UFO, THIN LIZZY, ANGEL WITCH, SATAN, BLITZKRIEG, RIOT, JUDAS PRIEST, CLOVEN HOOF, DIAMOND HEAD, PICTURE and CRIMSON GLORY. EMERALD are one of the crown jewels of the Dutch Heavy Metal scene. We have to go back to the mid '70s to find the origin of this band. 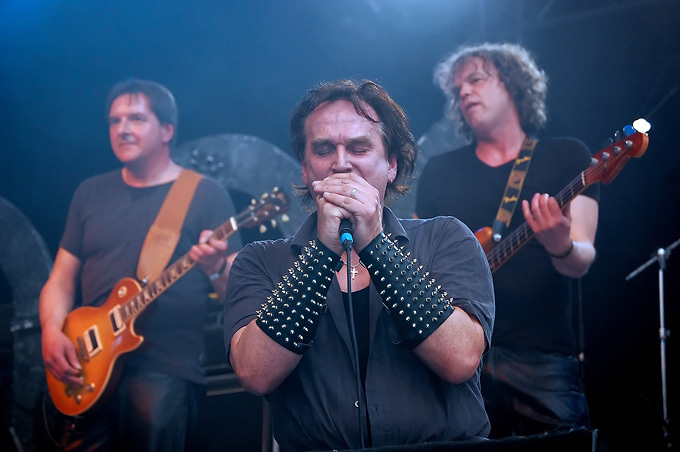 It was then when four school friends, Bert Kivits (vocals), Allard Ekkel (guitar), Joop Schipper (bass) and Henk Schipper (drums), decided to start a band and call it THE TRASH. Their earliest demo recordings are from 1976. In 1979 the band name changes to WARRIOR and with Essie Zagers on bass and Gert Slot on drums they record a 4 track demo in August of 1984. Of course, there were later a number of bands called Warrior (only in Holland alone there were a few of them), so at the end of 1984 they decide to change the name to EMERALD, inspired by a Thin Lizzy song. Their music shows strong influences of NWOBHM and Ozzy Osbourne. What everyone notices is the extremely high pitched voice of the singer Bert Kivits, often described as a mix of Geddy Lee and Pat Benatar - a love or hate thing and nothing in between. But besides Bert's voice also the Randy Rhoads style playing by Allard Ekkel is quite remarkable and gives EMERALD their own unique sound. No wonder the band gets good reviews. Megaton boss Bram Kloos gets interested and on the 24th of January 1985 the band signs a deal with Megaton. When later that year the "Down Town" album is released, EMERALD got a great live reputation in their region and is called "The best Heavy Metal band from the East" (of Holland that is). Although the LP does not have the best production and artwork, it still gets a lot of good reviews. It contains the 4 songs from the demo plus some new ones. Unfortunately, soon after it's out, Megaton goes bankrupt and the band is back on the street again. In the meantime, they replaced drummer Gert Slot with Rudy Marissen who played in REVENGE before. With him they write new songs, but no new demo is released. In 1986 they play a gig in Enschede which is recorded by Radio East. This recording is the only recording where the songs like "Robin Hood", "Wet Dreams", "Karen" or "Back to the Future", all written after "Down Town", can be heard. And it proves the band only got better after the album. But they didn't get a new deal and at the end of the '80s they split up. In 1998 the band members are contacted by German "That's Metal" magazine for an interview. It puts EMERALD back in the spotlight. One year later "D-Day" from the "Down Town" LP appears on the 1st Heavy Metal Maniacs compilation CD. Iron Glory Records from Germany shows interest to put out a CD release of the album. They change the artwork to something "more metal" and change the title to "Iron on Iron". In 1999 the CD gets released and receives very good reviews in underground zines all over the world. The band is honoured by all the attention and decides to answer all the begging to do a reunion gig. This happens in October 2002 when EMERALD appears at the Heavy Metal Maniacs festival, playing all their classics. The good news reaches Germany, and some time later EMERALD hit the German stage for the first time in their history. Around this time the band added Paul van Rijswijk (ex-HAMMERHAWK) as the 2nd guitar player. Among the most memorable gigs are the ones at the Keep It True V festival warm-up show in November 2005, where a hall full of people goes totally nuts and sings every song word for word, and the spectacular show in Athens, Greece, at the Up the Hammers festival in March 2009. In April 2010 EMERALD play at the Keep It True in Germany for the second time and and in October the same year again at the Heavy Metal Maniacs festival in their home country. Soon many more gigs and festival appearances follow. In 2011 they play at Muskel Rock festival in Sweden, at Very 'Eavy festival in Holland and then in Madrid. In 2012 they go to Athens again, and then play at Bargnspop festival in Holland. 2013 is the most busy year for the band, with appearances at Taunus Metal festival in Germany, Metal Magic festival in Denmark, Sun Valley Metalfest in Italy, Power of the Night festival in Cyprus, Taken by Force festival in Holland, and To Hell with Cancer festival in Holland. In the meantime, a brand new song "New Gods" is recorded and featured on the Hard Rocker magazine (Poland) "Keep It True" compilation CD in 2010. In 2011 the debut album gets re-released on vinyl by Iron on Iron Records from Greece, and in 2014 EMERALD is featured on the Dutch Steel compilation album. In 2014 the band starts to write new material for the long awaited second album. The new songs prove that the unique EMERALD sound is still there. The band also reworks some of the early material that was written in 1986 after the release of "Down Town" and even from the times before that. In 2015 EMERALD start recording the new album at the fully analog Voodoosoundstudio in IJmuiden with help from producer Ron Goudie (Cirith Ungol, Stryper, Death Angel, etc.) and EMI producer Klaas Leyen (The Cats, etc.). It's engineered and mixed by the band's guitarist Paul van Rijswijk. 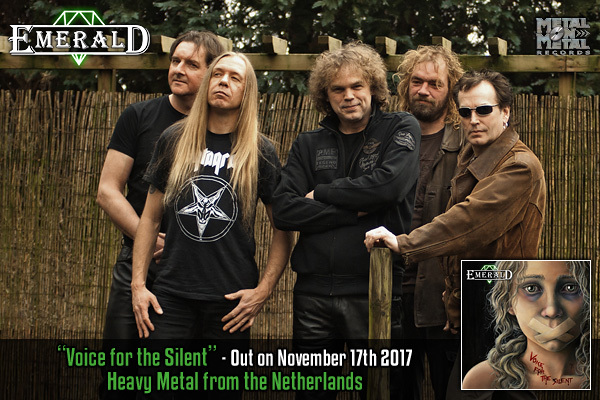 EMERALD sign a deal with Metal on Metal Records for the release of "Voice for the Silent" CD, which at last sees the light of day in November 2017. The album is like a time machine, recorded without any digital tricks - its sound will take you back to the glory days of '80s Heavy Metal! The voice of Bert Kivits is stronger than ever before and, together with the blistering guitar work of Allard Ekkel and Paul van Rijswijk, the thundering bass of Essie Zagers and Rudy Marissen's pounding drums, it makes it a worthy successor to their debut album from over 3 decades before. Meanwhile, EMERALD presented their new bass player André Wullems (LOVELL'S BLADE, ex-PICTURE) at the Bargnspop festival in July 2017. For 2018 the band is already confirmed to play at Up the Hammers festival in Athens, Greece, and at Pounding Metal Fest in Madrid, Spain.